This is a boat that would suit me just fine. I like the simplicity of it and I like the traditional proportions. The design was inspired by a Sparkman & Stephens boat designed in 1935, Babe. Babe was designed to race under the Universal Rule and was quite a stunningly good looking boat. But today the proportions and features of the original Babe would be very hard to market. S&S has taken the Babe inspiration and given it a modern makeover while preserving the classic look. The original Babe displaced 11,200 pounds, about twice as much as the new 30. The D/L of the 30 is 121 and the L/B is 3.69, so this is a moderately light, narrow boat. In plan view the distribution of beam is a far cry from the fat-fannied boats we see today. 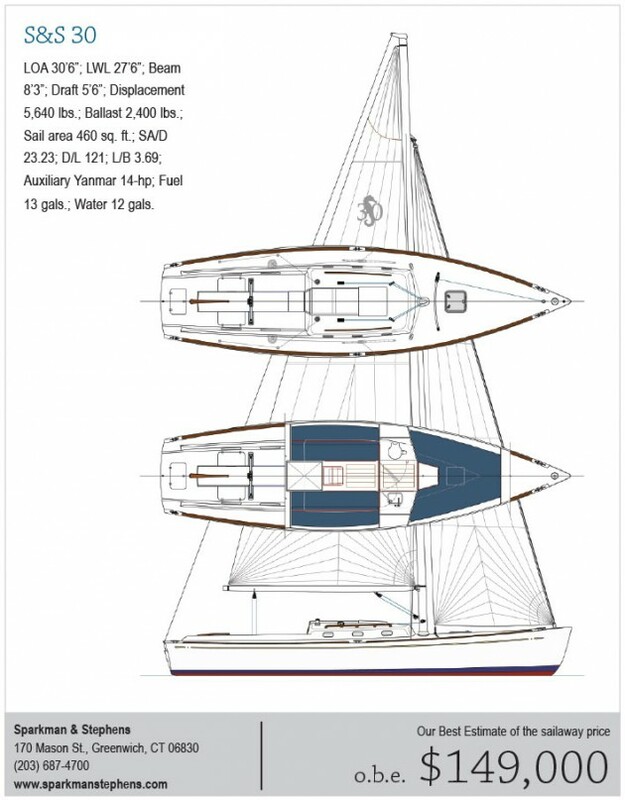 The transom comes almost down to the waterline so there is virtually no overhang aft and the shapely bow profile and minimal forward overhang ensures that this boat is all sailing length. That has been a theme this month. I'm not wild about the sheer but sheers are like shirts-we all have our personal preferences. This is really a daysailer, The interior would work for short cruises, but there is no provision for a galley. I think a small two-burner camp stove would fit nicely on one of the cockpit seats or maybe on that seat level area aft of the tiller head. The V-berth is big but you will have to squeeze by the mast compression post to get in and out. The head area is spacious and sure beats the arrangement I have on the mighty Perrywinkle where the head is under the V-berth. The bulkhead that separates the head from the main cabin is cut away and is closed by a curtain. The settees are also big and would make very comfortable berths. Headroom is 57 inches but the companionway hatch is long so that's where you will stand up straight. The 30 has a tall rig and an SA/D of 23.23. That's enough horsepower per pound to give the boat good speed in light air. The jib is self-tacking and the track allows for a 10-degree sheeting angle. The jib sheet is led forward from the car to an in-deck turning block then aft to near the end of the cockpit where it takes another 180 degree turn and leads to a clutch tucked in the coaming pocket. There is no jib sheet winch. If you want to use an overlapping genoa you can have coaming-mounted sheet winches mounted just forward of the mainsheet traveler. With the self-tacking jib you could sail this boat effortlessly all day. The cockpit seat level is open to the transom. This gives a notch to the transom shape but also reduces the visual size of the transom. The cockpit well is narrow but some years ago I did some experiments with ergonomics and cockpit widths and for me the width of the well worked best at 22 inches. This way I could sit comfortably with my feet on the leeward seat edge and my knees slightly bent. I'm sitting here typing away and it's pouring down rain outside. It's blustery. But I can imagine a nice, sunny day with a steady 12 knots of breeze and a favorable tide and me in my new 30 leisurely and efficiently beating up Puget Sound with a slip reserved at Port Ludlow. Upon arrival at the marina I would not fire up the 14-horsepower Yanmar but I would sail the 30 into its spot on the outer pier just to show off in front of the powerboaters there. I'd do my best to wipe the smug look off my face. Then I'd go to the restaurant and order lamb chops.